At Music Together®, it's our mission to make the world better by making it more musical. It's a huge task, and we know we can't do it alone. That's where you come in! 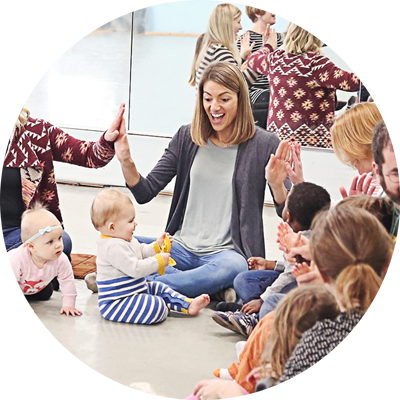 If you love children and music—and would enjoy being your own boss—Music Together might be a perfect fit for you! As a licensee, you can offer family and in-school music classes in your area or add Music Together to your community arts organization. And if you're a credentialed allied health professional, you can be licensed to use our program in therapeutic settings. Of course, you can teach classes at an established Music Together location, too. But starting your own Music Together business is an exciting career choice that requires only a small financial investment, and no special business training or formal music credentials. We provide all the help you'll need to get started! Many of our most successful licensees fell in love with Music Together while taking classes with their own children. Actors, singers, musicians, music educators, dancers, teachers, therapists, parents—all have found meaningful work as Music Together licensees. Start your own small business and become a Music Together center director. Bring Music Together to your childcare, preschool, public school, or other school setting. As a credentialed allied health professional, use Music Together in your practice for individuals or small groups. Add Music Together classes to your community music school, senior facility, or social service organization.